Systems thinking contributes to acceleration in several ways. It helps provide a strategic focus to the program office, enabling them to arrive at effective solutions sooner and avoid unnecessary delays caused by re-work. 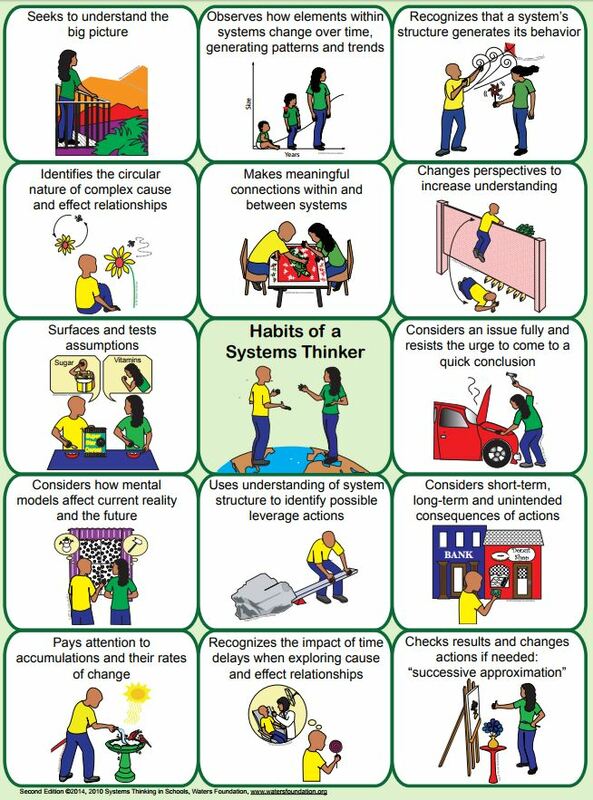 The Waters Foundation provides 14 key habits of a systems thinker, to include changing one’s perspectives and exploring inter-dependencies. 1. Create a model of key, interconnected parts of the larger system your problem sits within. 2. Study why system behaviors are natural byproducts of the way parts connect and interact. 3. View your problem as one of the natural byproducts of the structure/relationships of the system. 4. Brainstorm how to change the structure and interrelationships so the problem is eliminated. 5. Your system may be complex if it has many tightly coupled parts that can independently react to rapid changes in the system to create non-linear and emergent behavior. 6. Look to reduce the number of components, minimize the tight coupling of components, break feedback loops in the system, and limit the autonomy of independent behaviors of the components to reduce the complexity of the system to limit the emergent behaviors of the system. This may allow you to use the above simplified Systems Thinking approach. 7. If this is not possible, you should contact our Systems Engineering Technical Center to explore sophisticated techniques such as system dynamics for these ‘wicked’ problems. Apply to problem solving when components as part of entity should best be understood in the context of its relationship with other components of the entity, rather than in isolation. Structure: The orientation and connections between the project components and how the project itself fits within the larger environmental structure. The internal structure leads to the project function while the external structure influences and modifies the project operations and outcomes. Relationships: The interactions, links and dependencies between the project components. Also, the connections between the project and the components and systems in the external environment. These relationships lead to the system dynamics, behavior and performance of the project. Constraints: Characteristics of the environment and context within which the project exists. These set boundaries and conditions for the project operations and may be inherent to the environment or dictated by the sponsor. Assumptions: Initial conditions and definitions which impact a project’s definition, scope and performance. The assumptions can cover different aspects of the project (e.g., conceptual, geographical, temporal, stakeholder etc.) and their applicability varies. Goals: Near term and strategic sponsor oriented outcomes for the project. The project function and transformation should be focused on these goals.